Make it a point, as Jesus says in Luke 18:1, to "always pray and never give up." Be relentless in prayer. You never can tell what God has up His sleeve for the waiting, compliant believer, especially the believer who complies without wanting to, doing so out of faith in and love and respect for Christ. Don't let the baying merchandisers rob you of your "wonder and awe" at the very thought that God took on human flesh to set us free from sin and death. Looks like another impressive recruiting class for Ohio State basketball. Two are from Texas, one from Georgia, and one comes from Ohio. Life may bring you to tears and you may think that God doesn't hear or doesn't care. In times like those, these words from Isaiah, while not taking away the pain, can comfort us. They're particularly appropriate, I think, for anyone who is trying to do the right thing in God's eyes and is committed to it, but sometimes, in the middle of the hurt, can't see the point, can't see where God is working, and feels alone. God, we are assured, will be standing when the last tear has been cried and He alone can bring us comfort and renewal. "7 Ways to Shorten the Distance Between You and Your Best Friends"
Some, maybe all, of this stuff is obvious. But in our increasingly mobile society, it's difficult to maintain long-term ties that bind. The effort is worth it though. Having just one best friend is a blessing second only to salvation in Christ. What Moves Will the Reds Make This Off-Season? Here are the latest hot stove reports, rumors, and speculations. Is Fareed Zakaria a Serial Plagiarist? I would rather think not, because I've always liked him. But the latest evidence indicates that Zakaria was swiping other people's writing (and thoughts) multiple times before the 2012 incident to which he admitted and which earned him a brief suspension. "Your love is teaching me how to kneel, kneel"
Crank this one way up! A picture of my dad, who was in the United States Air Force from 1950 to 1954. Today is Veterans Day. I remember when my grandparents called it Armistice Day. And that's what November 11 was, originally. The armistice ending World War One went into effect at 11:00 on 11/11/1918. When the war, certainly one of the most unnecessary exercises of human blood-letting in history, ended, there was a horror at the prospect of ever fighting another armed conflict. The death and destruction had been enormous. War was unthinkable. But within five years, Hitler would be in power in Germany. His chancellorship ended any idealistic notions that human beings, by force of law, could prevent war. Given the aggression of Nazi Germany, Fascist Italy, and Imperial Japan, it's hard to see how World War Two could have been avoided. For the United States, any thought of remaining isolated from the war begun by those "Axis Powers" (or from tough, coercive peace-making efforts, for that matter) ended with the Japanese attack on Pearl Harbor on December 7, 1941. I've talked in other places about the Lutheran understanding of the Bible's teaching on "the two kingdoms." It holds that God rules the world in two ways. Over His Church, He rules by grace. This is "the kingdom of the right," whose constituents have voluntarily surrendered to the Lordship of Jesus. They aren't perfect. But through "daily repentance and renewal," they seek to live in accordance with Jesus' great commandment: to love God and to love neighbor. They do so not through some coercion, but out of simple gratitude for having been saved by God's grace through faith in Christ. Absent this mode of rule, the world would be a far more inhospitable place than it is. God establishes governmental authority and power to do two things: (1) To keep human selfishness and sin in check; (2) To clear a place of sufficient calm that will allow people to hear His gospel of grace. Human beings, being human though, will, of course, often give vent to their sinful human nature, turning their backs on the authority of God over their lives, whether they consider themselves citizens of the kingdom of the right or the kingdom of the left. Sin, death, and darkness remain in this world--and in each of us--until the day Jesus returns, the dead in Christ rise, and He fully establishes the new heaven and the new earth. This means that while peace always remains a worthy goal, we will not always be successful in obtaining it. Jesus once was describing the signs of the end of this world that He will bring about when He returns. He said that all of the signs of His return had already taken place and that we all should be prepared for the end. And He said: "When you hear of wars and rumors of wars, do not be alarmed. Such things must happen, but the end is still to come." Wars are inevitable because we human beings are sinners. But on this Veterans Day, as I consider all the warring that my country has engaged in just in my lifetime and all the wars around the world that have happened in that same period, it makes me heartsick. The Korean War had ended about five months before I was born. Since then, America's military has been asked to fight or face hostile fire, most notably, in Vietnam (and Laos and Cambodia), Iraq (twice), and Afghanistan. Whether all these wars were unavoidable or necessary is a political question. And I have no intention of addressing that here. What I am saying is that, as a Christian, I'm no peacenik. I don't think that Christians are necessarily called to be pacifists. According to the New Testament, unless a government asks us to act unjustly, we are duty bound to God to serve our government, as though serving God. And that includes assisting in the execution of those wars that the government deems necessary. 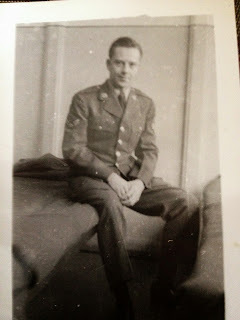 But, as I thank the veterans of the military, like my dad and my nephews, for their service to America, today, I also pray that our leaders and the leaders of other nations will be given the wisdom to avoid the use of war in disputes. No one should be asked to spend their lives in wars that have no good purpose. If memory serves, Dylan re-recorded all the songs for his broken-hearted Blood on the Tracks after the album artwork, with its liner notes and credits, had been completed. So, the first press of the LP credited the wrong musicians. But this track was, I think, part of the originally completed project. It's one of many great songs that appear on the LP, although Dylan changed some of the lyrics and the entire arrangement significantly for the final release. Youtube doesn't seem to have any videos of the final product. So, this will have to do, a wonderful cut from my favorite Dylan album. Martin Luther was born on this date in 1483. His work of reforming the Church goes on today. Everyone needs to hear the liberating message that we are saved from sin, death, and darkness solely by God's grace (God's charity) through faith in Jesus Christ. For more, see here. The other day I decided, as I do every week in preparing for my messages, to check out what different Bible commentators had to say about today’s Gospel lesson, Matthew 25:1-13. One commentator's opening sentences compelled me to stop immediately. That’s because he wrote that this passage was disturbing and didn’t sound like Jesus to him. We live in an era in which people who masquerade as Bible scholars are really Bible speculators, speculating that the Bible is wrong and that they’re right when it comes to understanding what Jesus is really like. They want to whittle Jesus, God in human flesh, down to what they want Him to be, turning the Savior the Bible calls, “the Lion of Judah” into a pet cat, making Him palatable to the masses, a benign teacher of platitudes who doesn’t disturb people. Nowhere is this whittling, this cheapening, of Jesus more apparent than in the misuse and the misconstruction of what the Bible calls grace. The Bible teaches, as I say obsessively, that we are saved from sin and death by God’s grace--God’s charity--through our faith in Christ. Through God’s grace given in Christ, we are forgiven and given the promise of God’s presence with us in this world and of eternal life with God in the perfect world to be. But we must remember, as Lutheran theologian Dietrich Bonhoeffer taught, that grace is free; but it isn’t cheap. Grace doesn’t flinch from telling us that sin is wrong. Taking God’s Name in vain is a sin. Gossiping is a sin. Dishonesty in financial matters is wrong. Failing to forgive those who have hurt us is sin. Sexual intimacy outside of marriage between a man and a woman is unholy in the eyes of God. Failure to honor those in authority, established in their offices by God Himself, is a failure to honor God. Grace agrees with the law about what God reveals in His Word to be right and wrong. Grace says, “Your sins are a big deal. They should spell death for you. But when you honestly confess your sins and trust in Jesus, the crucified and risen Lord, as your only hope for life, their power over you is destroyed.” That is grace! Jesus gives us a true picture of grace in our Gospel lesson for this morning. Please take a look at it now. Jesus has been talking about the coming end of this world and His return to bring judgment and to usher in His eternal kingdom for all who have trusted in Him. Now, He tells a parable, a fictional representation of the coming of His kingdom. In first century Judea, where Jesus lived, weddings, followed by days of banqueting, took place at night. A messenger would go ahead of the bridegroom’s party to let people in the bride’s neighborhood know that he was on his way and to be prepared for the start of the festivities. In the parable, the wedding feast symbolizes the great heavenly feast that Jesus will one day enjoy with all His saints. Jesus, as in other places in the Gospels, is here portraying Himself as the groom. In doing so, Jesus isn’t just claiming to be the Messiah, as we’ve talked about recently. He is also claiming to be God. In the Old Testament, God is often portrayed as the loyal husband of His chosen people, Israel. The twist in this parable is that the ten virgins, who all want to go to the party and celebrate with others, are the Church. They’re you and me. And like you and me, they want to be with the groom at the feast. They take up their lamps in order to wait for the arrival of the groom. Please notice something about this verse: Everyone is invited to the feast. God wants everyone to be at His table in eternity. Jesus died and rose for everyone. But, as we’ll see, not everyone responds in faith and those who refuse Jesus’ call to daily acknowledging our sin and receiving forgiveness and new life by faith in Him willfully separate themselves from Him. And God will, at the ends of people's lives and at the end of this world's life, respect the choice of those who have rejected His invitation. The oil for the lamps represents things like the fellowship of Christ’s Church, attentiveness to God’s Word, receiving the Sacraments so that the light of faith isn’t taken away by the darkness of our world and of our sinful selves, a willingness to do what God wills for us. These are the things we need to make it through this world with our faith intact, our relationship with God intact, our integrity restored. If we’re to be ready for the return of Jesus to our world, or ready to face Him at the moments of our deaths, or ready simply to deal with the everyday challenges of life, we need to be stocked up on the oil of an ongoing faith relationship with Christ. If not, we could run out, the light of our faith extinguished, our relationship with God destroyed, our only reason for hope displaced by the distractions of life. The only people who will remain standing when Jesus comes to bring this world to its end, the only people who will remain standing when the chips are down and the devil and this life hit us with their worst shots, are the people who stand on Christ alone. They keep burning with faith, hope, and courage. The five young virgins left to welcome the bridegroom, not thinking about what they needed to power their lamps. That’s like us when we make decisions or establish priorities without leaning on God. We then stand naked in the face of evil that will otherwise overtake us and destroy us for eternity. Jesus isn’t commending selfishness when He has the wise young women refuse the request of the foolish ones for more oil. Here’s what He is saying: No one else can have your relationship with Him for you. We can’t rely on our parents’ faith or our friends’ faith or, God forbid, our pastor's faith. Faith is you and I personally trusting our lives to Jesus ourselves. The only one who can ensure that our lamps are filled with the oil of enduring faith is us. We need to keep filling up on Christ and His Word through worship, study of God’s Word, receiving the Sacrament, trusting Christ’s presence in, with, and under the bread and the wine. These are the ways God can prepare us for the ends of our lives, the end of the world, and even for just waking up tomorrow morning. And the next morning. And the next. Jesus is using a common, idiomatic saying here. He's not saying that the lord inside the house was unaware of the identities of the women trying to get into the wedding feast, any more than God Himself will be unaware of the identities of those who have let their faith lapse or turned their backs on Christ or let things other than God become more important than God. He knows every human being by name and DNA. But God cannot in eternity, pretend that there is intimacy between Himself and those who, during their time in this world, forgot all about Him. "Not everyone who says to me, 'Lord, Lord,'’ Jesus says in Matthew 7:21, “will enter the kingdom of heaven, but only the one who does the will of my Father who is in heaven." And, Jesus says in John 6:29: “The work of God is this: to believe in the one he has sent." That means trusting in Him and seeking His power in our lives even when we think we’ve got everything under control and that we don’t need God’s help, counsel, or authority over us. That's our job: to accept grace, to receive grace with honesty and vulnerability and gratitude. This is where the Bible speculators flinch. They want a grace without admission of guilt, without the acknowledgement of the human need of God Who is infinitely greater than we are. They want a grace without God telling us to follow Christ and Christ alone, a grace with no need to trust Jesus with our lives.